← A Hop, Skip and A Jump…. Note: the following post describes events prior to the posts regarding our tornado experience. 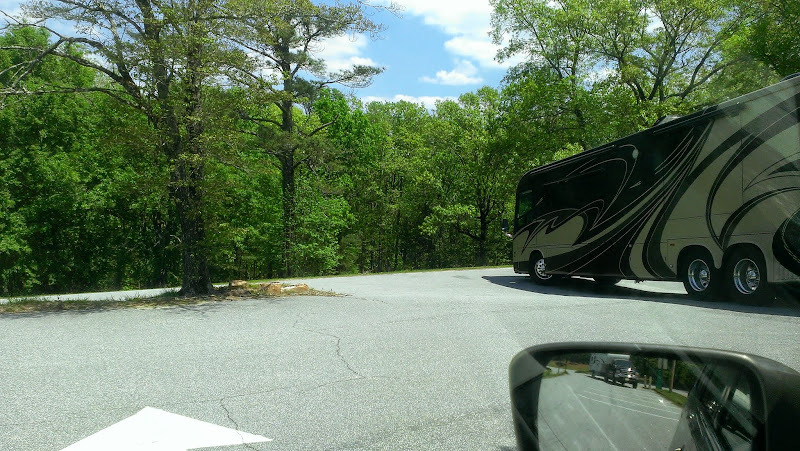 So on the morning of Thursday, April 24th, it was time to leave Cotton Hill COE Campground, heading to Franklin D. Roosevelt State Park in Pine Mountain, GA, about 105 miles away. So we said goodbye to Mr. and Mrs. Goose and their gosling quartet (they didn’t seem to care that we were leaving since their major food source was from our neighbors, not from us), waved goodbye to our nest building bird buddy who was somewhere out there, pulled the beast forward up the slope a bit so Le Capitaine (or maybe being of the Italian nature it should be Il Capitano) could re-install the tow bar (if you remember the tow bar hit the pad at arrival so we had to remove it) and off we went. Much less traumatic than our arrival to say the least! No awful scraping sounds on the way out. After stopping at an overflow parking area to hitch up the toad, we were on the road around 11 a.m.
You can see our route on the map above. 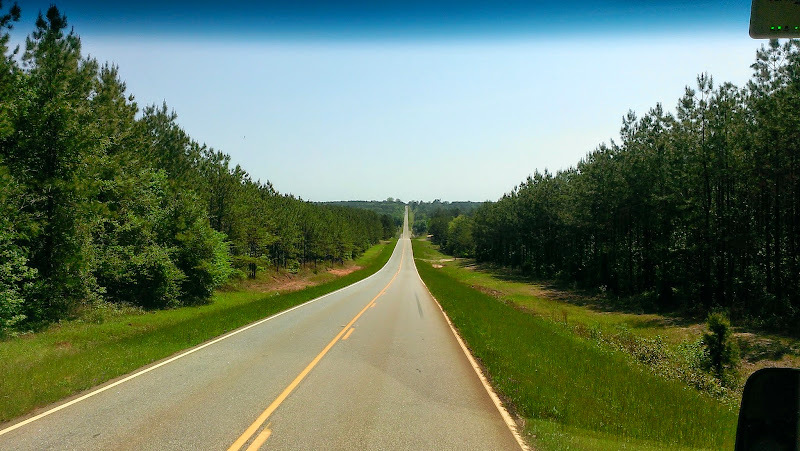 Initially we were on a two lane section of US-27 but later it became a 4 lane divided highway. It was a fairly easy and uneventful drive. 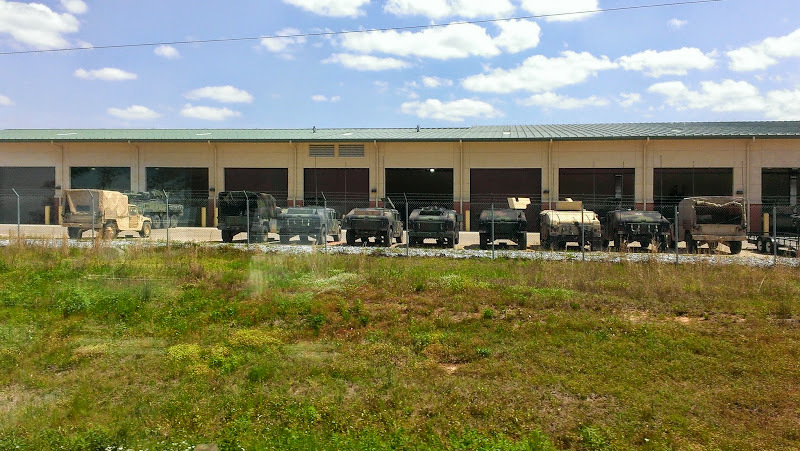 Near Columbus we passed by Fort Benning where we could see lots of hummers, jeeps, tanks and trucks parked behind a chain link fence next to the highway. 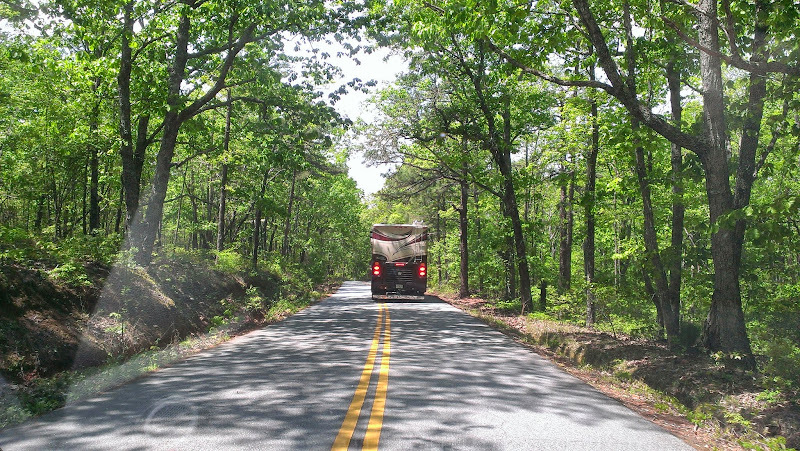 As we made the turn however onto Pine Mountain Highway (GA-190W) in FDR State Park, the road quickly changed into a rather twisty, turny, hilly road. Glad Rob was driving and not me! Gulp! Though I guess an occasional pretty view made the white knucklin’ (me, not Rob) worth while. Maybe it was just us, but the signs didn’t seem that clear, so we almost missed the turn into the registration area parking lot but luckily realized it before we drove too far past it. As Rob made the quick, sharp maneuver into the lot, we heard a scraping noise like we had hit something. Oh, oh! After parking (taking up several car spaces) Rob checked the exterior of the coach and initially found nothing, but later found a teeny scrape on the right front bottom edge of the front cap (not visible except to road kill) where it had apparently scraped the ground, but no real damage done. That’s good! We walked up to the registration office where we were given a map and told that the 40′ sites were marked in yellow so to be sure to pick out a site with a yellow marker. The parking lot at the registration area wasn’t really geared for big rigs especially since we had pulled into the section where cars were supposed to park. And despite being told there were places in the campground to stop and unhitch (there were not) we unhitched anyway so Rob could back up if need be to make the very sharp u-turn needed to get back out. Good thing we did because he had to back up several times to maneuver the beast through the u-turn and along the road which was unlevel and very narrow with deep gullies on either side. As I sat in the van, I was really nervous watching him, thinking he was going to land in the gully or topple over but as usual, he did fine. 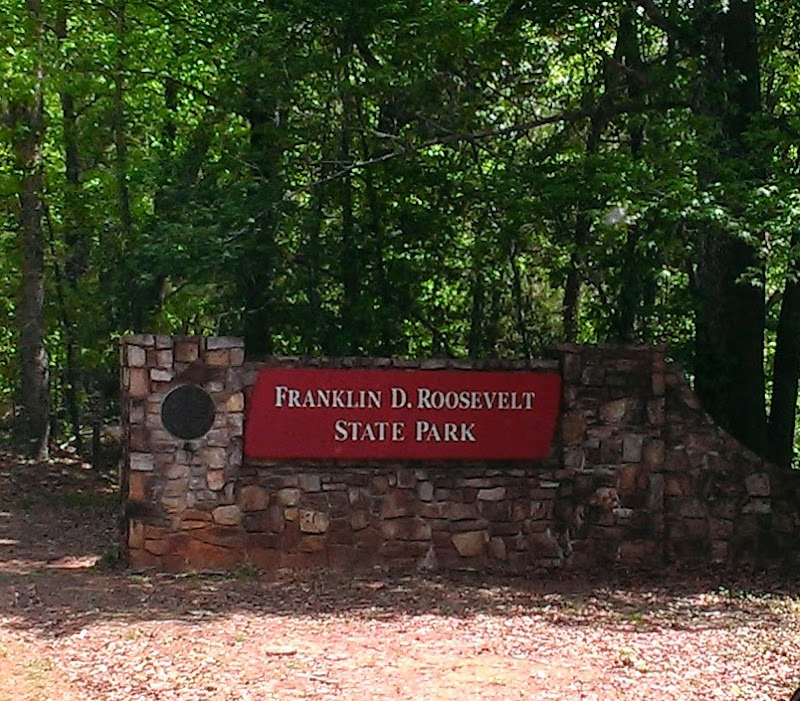 Unlike Florida, in the GA State Park system when you make a reservation you don’t reserve a specific site. That’s good news because if you want to extend your stay (assuming there are sites available) you don’t have to move to another site, which is often the case with the FL system and can be a pain. 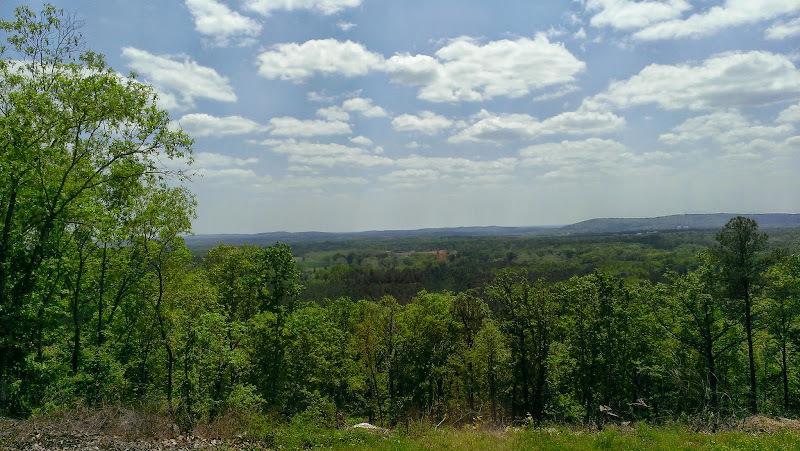 On the other hand, the bad news about the GA State Park system is that you don’t reserve a specific site – huh, what’s with the good news and the bad news at the same time? Without a specific site reservation during busy times it creates kind of a frenzy as everyone circles around each loop several times looking for a desirable site (to our boater friends, it’s kind of like the free-for-all trying to get a town mooring in New Harbor, Block Island, RI during the summer). So be forewarned, you need to get to this park early in the week and early in the day during peak times (Fri-Sat), otherwise you will find that the only available sites left are the least desirable – and if you are mega-beast (43′) sized like us there are only a few of the 40′ sites that we could fit into comfortably. In addition, we noticed many smaller rigs reserving 40′ sites, probably because they tend to be a bit more private, so it is entirely feasible to have a micro-rig take a mega-beast sized site, leaving only micro-rig sized sites and nothing suitable for larger rigs. After checking in, we both (Rob in the MH and me in the van following him) drove along Lake Delanor Road down the steep hill and eventually passing by loops #1, #2 and #6. From a distance we could tell that we would have a difficult time maneuvering our mega-beast through these loops and finding a suitable site that was long enough, so he headed for loop #5 which we had heard had quite a few pull thrus and hoped that we would find one big enough for us. Rob figured that he would park the coach on one site, then we would drive around in the van to see what else was available. He pulled into pull-thru site #509 and after a short discussion and looking at the other sites nearby, we decided it not only fit us, it was one of the best, so we would stay there. 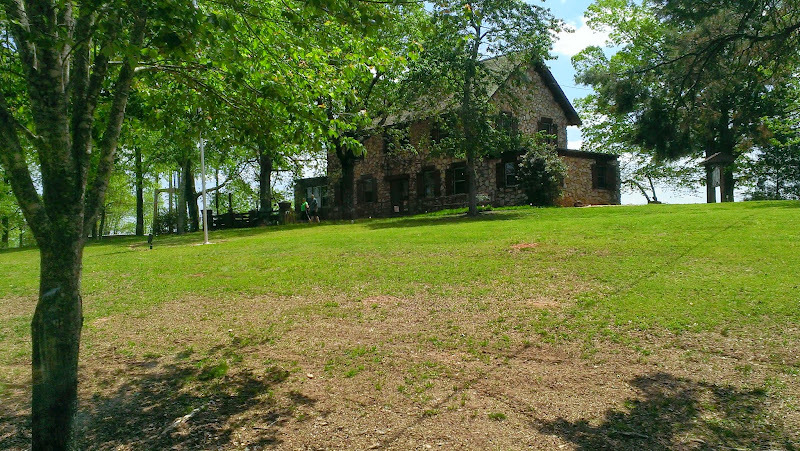 FDR State Park has 9,049 acres with 21 cottages ($100-$125), two of which are dog friendly at $45 per dog, 140 tent, trailer and RV campsites ($25-$28 for 40′), 16 Backcountry campsites ($10 per person), 7 picnic shelters ($50), a group shelter that seats 85 ($145), a group camp (capacity 75, $505), 2 lakes (15 acre Lake Delanor, 25 acre Lake Franklin), a Gift Shop and Liberty Bell Pool. 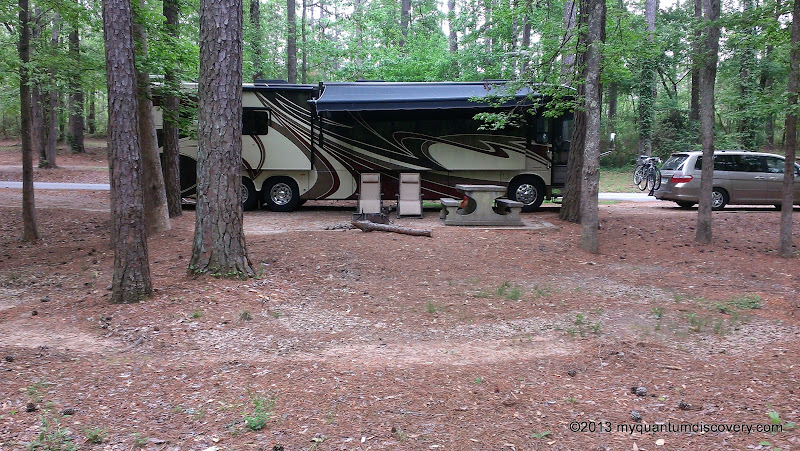 All sites have water and electric hookups (no sewer), a cement picnic table and a fire ring. 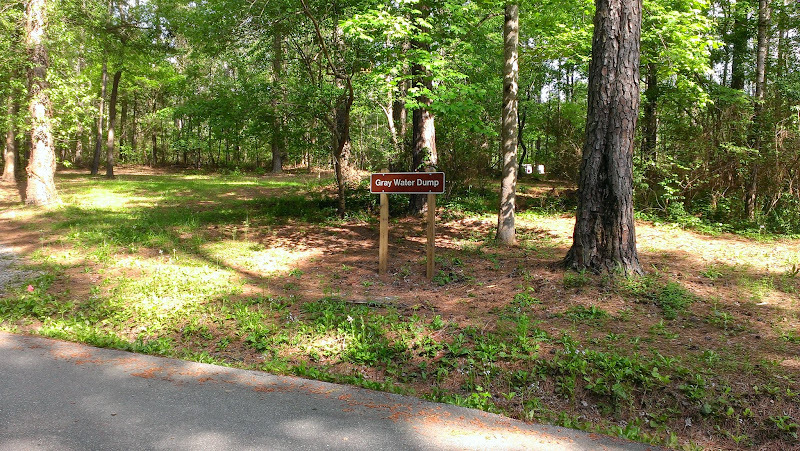 It was also interesting to note that within the campground (at least on loop #5) there are several specially designated spots for gray water dumping – that is very unusual. And it just so happens that there was one directly across from our pull thru site. We have never seen this at any other campground and since the grey water tank is the fastest to fill up, having this option provides the ability to stay much longer without making a trip to the dump station. Of course you must dump a few gallons at a time via a bucket, but that proved to be a minimal hassle and provided the benefit of relaxing our water conservation somewhat. We were not able to get a fix on any satellites for DISH Network in either the Eastern or Western arcs, even with the tripod, just too many trees on this site. We were able to pick up a few OTA TV channels however, and our Verizon signal was decent enough with a signal booster (Wilson Sleek). AC Power was steady but the water was unusually soft – not a problem, just quite a bit different from the hard water we have come to expect. So once we settled in, we had a rather interesting experience but we’ll tell you about that in our next post!